IOTA's call for Observers, Baily's Beads videos requested. The International Occultation Timing Association (IOTA) seeks observers to video record the Baily's bead phenomena at this eclipse from the USA. North and south umbral eclipse limits need to be covered. Data obtained will be used in the continuing study to detect possible solar radius variations. 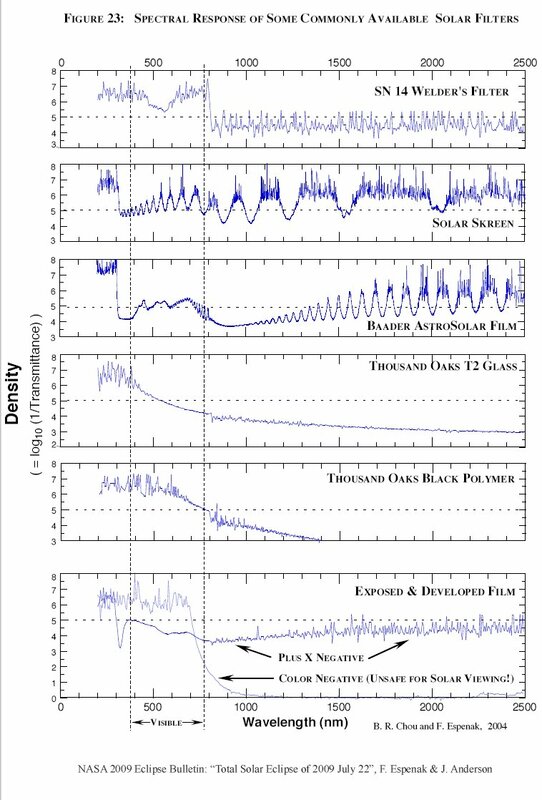 Purpose of Observation: The purpose of these observations is to derive a solar diameter data point as per the diagram below. 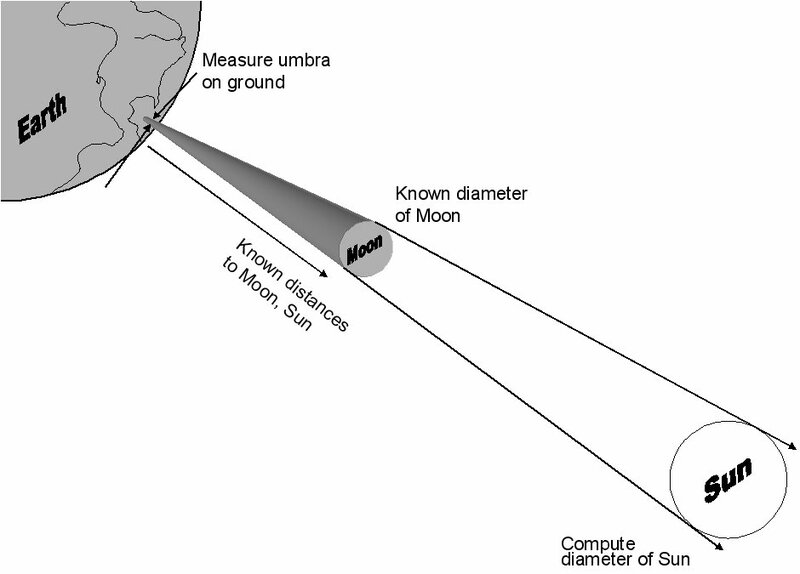 From the diagram, the known quantities are distances to the Sun and Moon, and width of the umbra (or anti-umbra for this annular eclipse) on the ground. The unknown quantity is the Sun's diameter. Brief Description of Observations needed: We will observe at the eclipse north and south limits in northern California and southern Oregon. This area of the path has the best weather prospects. 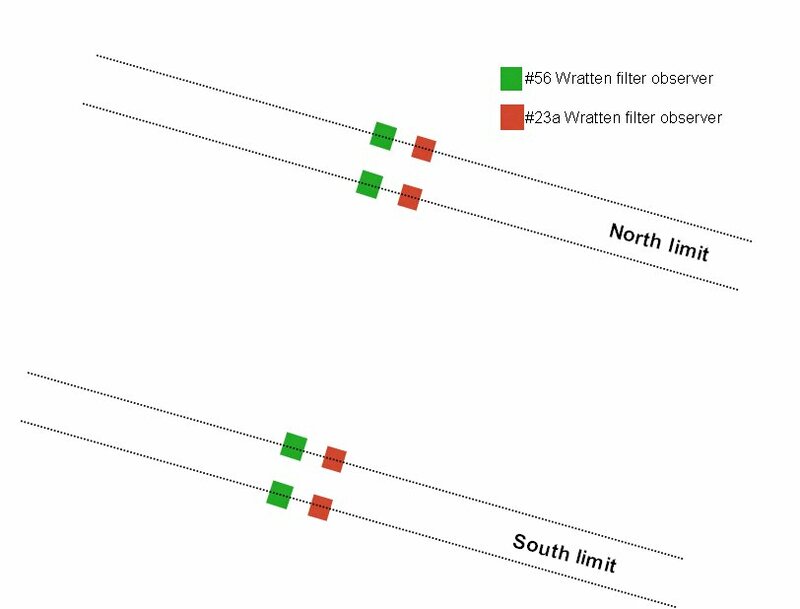 We are not necessarily looking to space a large number of observers out as in a lunar graze expedition, but we do need a minimum of 8 observers, 4 at both north and south limits, this includes 2 observers at identical positions for each station using different narrow band filters. The Baily's beads caused by the Moon's rugged line of sight limb will be video recorded. As an example see this video below of the January 15, 2010 annular eclipse (left) and a screen shot (right). This is the field of view (FOV) observers should strive for for high resolution video of the beads. The FOV at right is approx. 15 arc-minutes. As with any other type of occultation observation, we will need your geodetic position and elevation on the WGS 84 system. Our previous experience has shown that even a single station at each limit with good data can yield a solar diameter. Sun's Diameter at Different Wavelengths: The Sun has slightly different diameters at different wavelengths. So we need to standardize our telescope and recording systems and record at the same wavelength range, and that wavelength needs to cover near to the Picard satellite's 535nm and 607nm bands. To do this, we will all use the identical solar filter (see below). The Picard satellite now will be the standard of solar diameter measurements and our effort will be to calibrate ground based measurements to Picard. 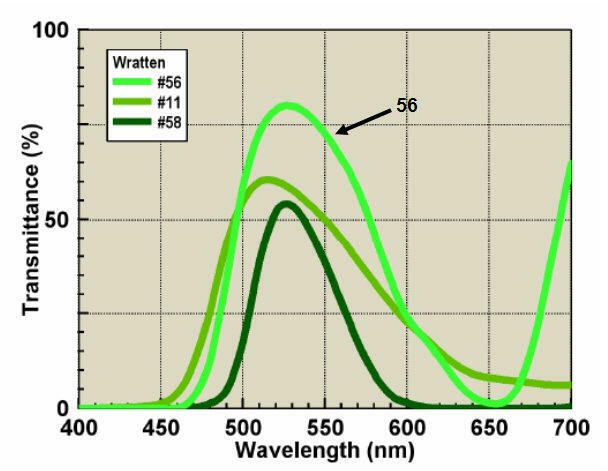 To zero in on these specific wavelength, we will additionally use narrow band filters as described below. The #23a filter (left) will allow the 607nm band and block out the 535nm band entirely. The #56 filter (right) will be centered on the 535nm band with very small response for the 607nm band. The Kodak wratten gelatin filters are made in flimsy flexible sheets that are easy to scratch so they must be kept stored when not in use. I have three (3) #23a filters left. They can be cut into 1.5" squares and sent to prospective observers. Cost $7 mailed. Eclipse Stations: With the 2 type filters we will station observers as per the diagram below (not to scale). The minimum of eight (8) observers includes each filter at each station. Equipment: In order to get matching good results, we need to use as close to the same aperture telescope as possible, same video camera, identical solar filter, identical narrow band filters and GPS time insertion. Telescope: The beads are relatively bright and we have super sensitive cameras, so a 3"-4" (75mm-100mm) aperture telescope is the maximum size needed. If you have a larger scope, I don't think we'll able to use your data as the beads will be too bright. This will saturate the beads making them too bright to resolve and will also saturate what is known as the limb darkening function (LDF; see references below). Stopping the aperture down of say an 8-inch or 10-inch scope with an off axis solar filter of 75mm - 90mm aperture is perfectly acceptable. In order to get the needed 15 arc-minute FOV, the focal ratio of the telescope should be f/10 or slightly longer. Shorter focal length systems will not produce the high resolution beads needed for the reduction. For example, the Mighty Mini's won't cut it - their FOV is 2x3 degrees. A FOV with the full Sun won't work either, the resolution to see the beads isn't high enough. Experiment with your telescope/video system to reach as near to the this 15 arc-minute FOV as possible. Avoid using any focal reducers or barlow lenses if a all possible. The least amount of glass between your video camera and the Sun will avoid any unnecessary abberations/distortions to be introduced into the final data set. Opt for an existing f/10 or longer telescope system. And be sure your optical components are collimated and clean. Telescope Mount, Polar Alignment/Drive system: This is a daytime event, so you'll need to be able to (polar) align your telescope during the day or have it setup the previous night fully aligned. With the small FOV of 15 arc-minutes, we want the least amount of FOV movement during the 5-6 minute window the beads are visible. Any type of manual drive such as turning slow motion controls by hand is strongly discouraged. Use manual tracking only in a last minute emergency - if you have failure on your motor drives. Meade/Celestron owners can use Venus and (gosh!) the Sun to align, refer to your manuals. And once you have a daytime alignment, test it out on the Sun and know what adjustments to make to minimize any drift. Have the RA and DEC of the Sun and Venus for the date/time you align on hand to locate Venus. Determining North in Daytime: A compass can help determine North, but a hand held GPS is better. Walk in a direction that shows the digital compass facing due north or south. Or watch the coordinate screen until only the latitude changes (longitude stays constant). This is the N/S direction. A protractor (or bubble level protractor) can assist in setting your mount/wedge to your latitude. You can also estimate North by the position of the Sun. Know it's azimuth at any time with tables or a planetarium program. Do this way before the eclipse. At mid eclipse time in California, the Sun's azimuth will be close to 279 degrees. Video Camera: So for the video camera to use-- the chip's spectral response needs to be as nearly identical for all observers. We should stick with either Supercircuits PC-164C (Ex-2) or Watec 902H Ultimate. 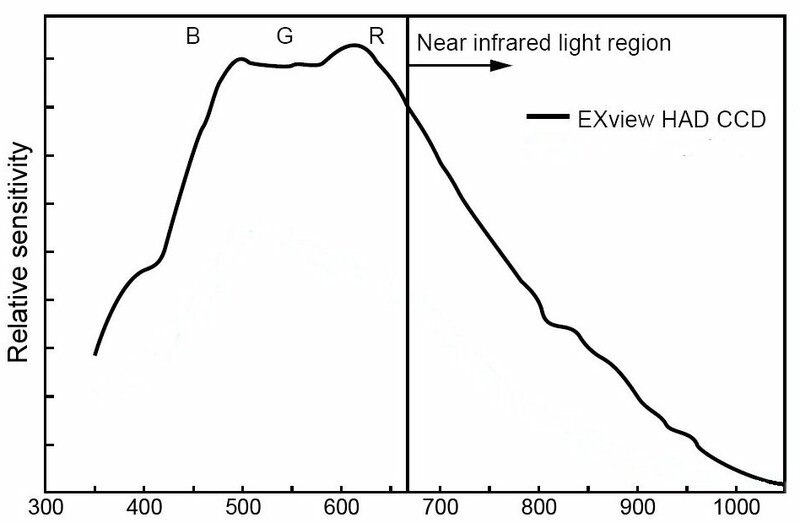 This will keep the wavelength sensitivity very nearly the same (see spectral response graphs below). Use of an integrating camera such as the Watec 120N, Supercircuits PC165 DNR and Stella Cam cameras are strongly discouraged. We want 30 frames/sec recording rates and the beads are bright enough to use our regular occultation cameras and DVR's. 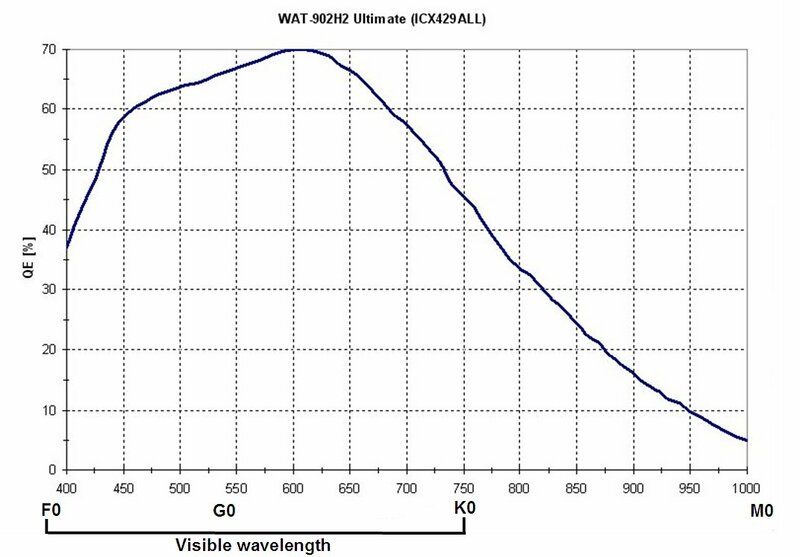 In addition, the Watec 120N chip spectral response appears to be different than the 902H chip. 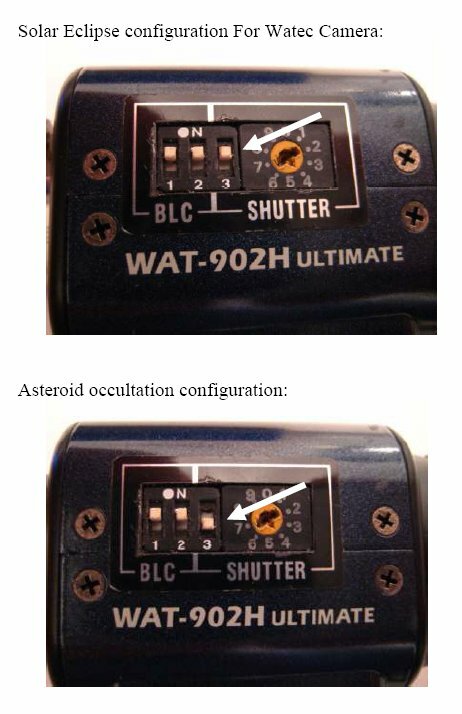 The Watec cameras have a adjustable gain setting, however in order to keep all observers on the same equipment set, the gain setting should not be over used, this is the reason for using similar aperture telescopes. 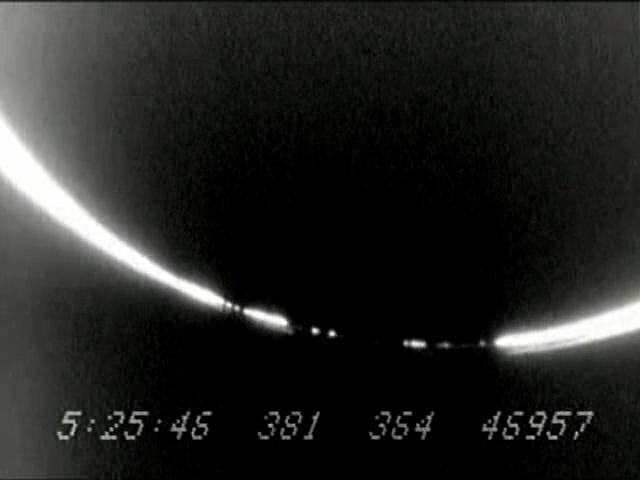 Observers should strive to obtain videos with similar beads sensitivity as the above January 15, 2010 eclipse video example. The Watec 902H cameras have 3 switches on the side labeled 1, 2 and 3. See the diagram below on how to set them for solar eclipses and asteroid events. For eclipses switch 3 needs to set in the "up" position or the beads will be TOO BRIGHT. Solar Filters- Walt Morgan has agreed to be the solar filter coordinator. He will order the Baader solar filters (visual not photographic) in a sheet and cut them to a size of 125mmx125mm or slightly larger so we can have the same filter (from the same run - same sheet). It's much cheaper this way. The cost will be around $10-$15, but could go higher. If you were to order the filter yourself, an 8.5x11 inch sheet would cost you $45. Contact Walt directly at wvmorgan13@sbcglobal.net to indicate you are interested in buying the filter from him. 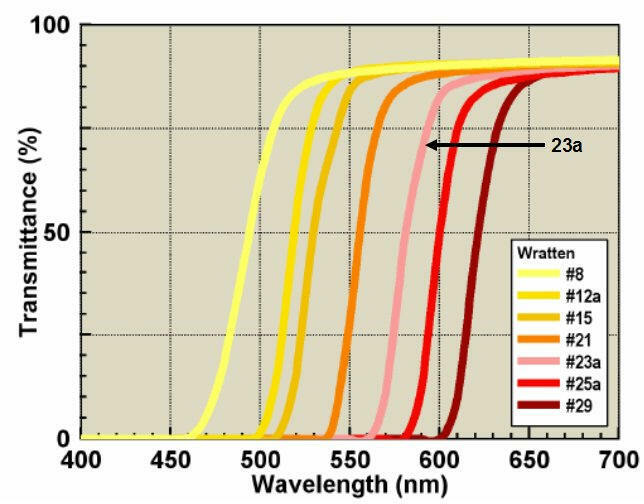 Many of us have several solar filters (I have 4) but keep in mind that we must observe with the same wavelength transmission to be able to get credible results worth publishing. IOTA has been criticized in the past for using non-identical filters. GPS Time Inserter: Only videos with GPS time insertion can be used. A readily available GPS time insertion device is the IOTA-VTI, http://www.videotimers.com. It is made and sold in the USA and available NOW !! DVR's: The recording device you use should be able to produce a video in AVI format with the least amount of steps (conversion programs, virtual dub, AviSynth, etc.) If you have a Canon ZR or other tape based recorder, know how to convert it to AVI format for LiMovie and an acceptable format for Tangra (which also reads AVI). Search ebay for "mini dvr 2.5"
Sky Transparency: As we need to keep the transmitted wavelength range the same for the stations, one variable is the sky transparency and California seems to have good weather prospects. We are also looking at a low Sun altitude of 20-21 degrees, being at the tail end of the eclipse track so the further west you can get the better, but the best clear sky transparency is the primary goal. Stations: Our stations will be set up in the range -1.8 to +0.5 (north limit) and 0km to +1.0km (south limit). Exact positions will be determined by possibly a site survey (if anyone can do it) and will be allocated at a later date. Interested Bystanders: This event is sure to draw people that see your telescope setup. As in a lunar graze or asteroid occultation event, it is advisable to keep the crowds away so you can can concentrate on critical time dependant adjustments to your telescope, gain control or any other real time action to get the best video. I have done 9 Baily's beads videos from eclipses (5 were good enough to use) and if people show up, I politely tell them that there is no visual observation and nothing to see from my setup. Trust me, when traveling to a foreign country plus the added pressure of getting the highest quality beads video, distractions are the last thing you need. After the video is done, I have no problem inserting in an eyepiece and "showing off'" the eclipse partial phases !! Eclipse Duration: The recording duration will be similar to that of a lunar graze, about 5 minutes. Area of Solar Limb to Record: Observers should center their telescope between the two cusps of the Sun as they close up and converge as the still photo above shows. Try and record this with the least amount of movement of the FOV. This will simplify the data reduction making it easier to analyze individual beads. The less jumping around of the beads, the easier it is for LiMovie and Tangra to analyze them. In the reductions, beads will be treated just like stars using LiMovie/Tangra, so keep em' steady. PRACTICE: Try to video record the sun as it passes behind a distant building or utility pole. Try to be at a far enough distance from the building/pole so that your telescope's focus is at or near the focus of the Sun - infinity. This will help you determine what gain settings to adjust your camera to match the light level of the sample video above of the Jan 15, 2010 eclipse. You only get once chance at this, so PRACTICE, PRACTICE, PRACTICE. Brightness of Beads: There is no sure way to determine the brightness of your beads during eclipse time. As the eclipse approaches annularity at your site, you'll have to make adjustments to your gain settings to get the best contrast. With the use of narrow band filters, again the best thing to do is PRACTICE. Again, if your beads are too bright, the LDF will be difficult to analyze, so try and strive for beads as in the above video. there was lots of glare washing out the beads. This was caused by internal reflections in the optical system, i.e., I did not use a dew shield. If at all possible try to use a dew shield to block stray light from coming in. Updates: This page will be updated from time to time as new information becomes available. Check back.